Hey, check out # 8! Pickles offer a completely guilt-free way to satisfy a salty, crunchy craving. And it's super easy to make your own: thinly slice cucumbers and douse them in rice vinegar. That's it! 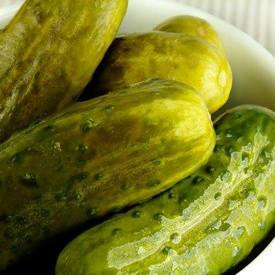 "Cucumbers only have 16 calories per cup and the rice vinegar only adds 1 calorie per teaspoon but tons of flavor," says Chicago nutritionist Dawn Jackson Blatner, R.D.